Nowhere in California is there a spot more real interest than the Harry Carey Ranch and Trading Post, situated in the beautiful San Francisquito Canyon. It's a ranch in all respects, consisting of over 1,200 acres. Here Navajo Indians live and work in their native way and large herds of Navajo and Karakul sheep graze on the slopes of the mountains. Postcard by C.T. American Art Colored of Chicago, No. 105720. To say the Carey Ranch was "a ranch in all respects" and that the Native Americans employed there "live and work in their native way" is a bit of a stretch. The Indians carried out a Hollywood version of their lifestyle for tourists  after all, the ranch was a tourist attraction and had little to do with life on the Plains. On a "real" note, it is reported that the Indians had a preminition that something bad would happen at the ranch on March 12, 1928, so they went away that morning. That night, at three minutes before midnight, the great St. Francis Dam broke, wiping out the Carey ranch and trading post. 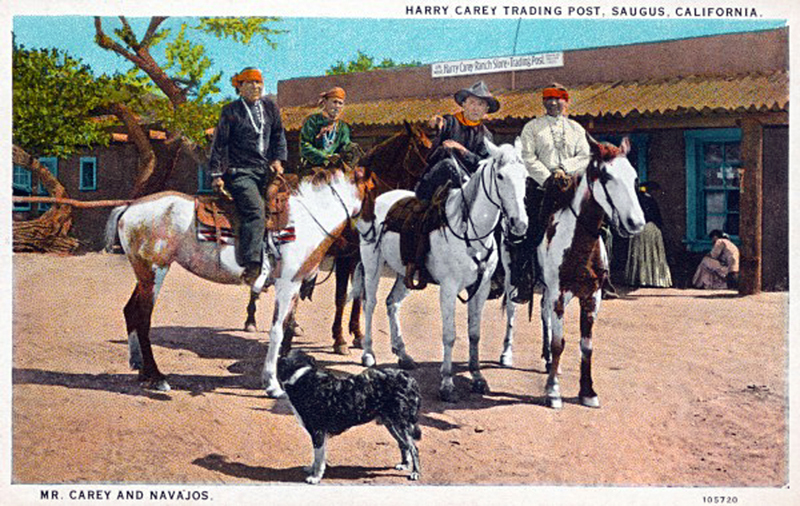 The Careys continued to live there, but the trading post and performances were to remain a memory. Of note in this hand-colorized postcard are the brown adobe walls, split log roof and blue window treatments. The sign atop the trading post (we might call it a gift shop) reads, in the middle: "Harry Carey Ranch Store & Trading Post." To the left are the words "GEN MDSE" (General Merchandise); to the right is "Navajo Indian Crafts(?)"